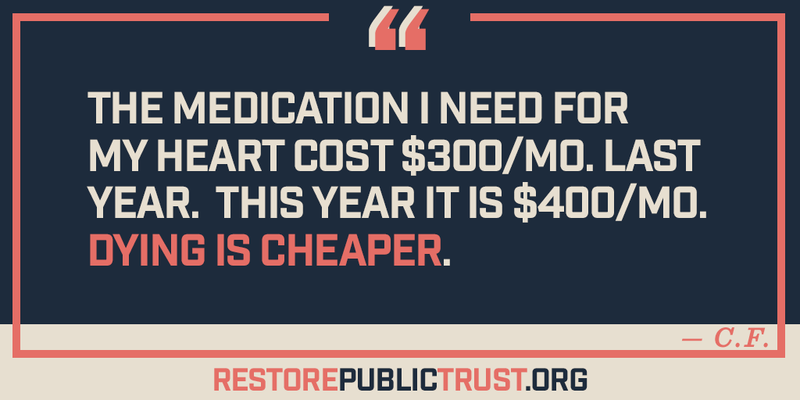 Washington — Today, as Pharmacy Benefit Manager executives testify about high prescription drug costs before the Senate Finance Committee, accountability group Restore Public Trust launched a digital effort that highlights personal horror stories of rising drug prices. The campaign features the stories of Americans who have been forced to pay too much for their medications, highlights the exorbitant price of prescription drugs, and questions why Health and Human Services (HHS) Secretary Alex Azar hasn’t done more to lower drug costs. Today’s campaign comes after Restore Public Trust has highlighted Health and Human Services Secretary Alex Azar’s history working for the pharmaceutical industry. The campaign features the stories of Americans who have been forced to pay too much for insulin, heart medicine, and other life-saving medications. In one featured story, someone died after they were forced to stop taking blood thinner when it became too expensive. Today’s hearing is one of several that Congress has held in recent weeks on the high cost of prescription drugs. The House Energy & Commerce Oversight Subcommittee is holding a two hearing series investigating rising insulin prices, with the second hearing taking place tomorrow. Restore Public Trust has previously called attention to Alex Azar’s big pharma past with a digital ad.